The Ryobi 5-inch Random Orbit Sander features a powerful 2.6 amp motor and 12,500 orbits per minute to deliver a smooth performance in a variety of sanding applications. The sander's ergonomic design offers improved comfort as you work, plus the tool accepts hook and loop sandpaper for fast and easy grit changes. 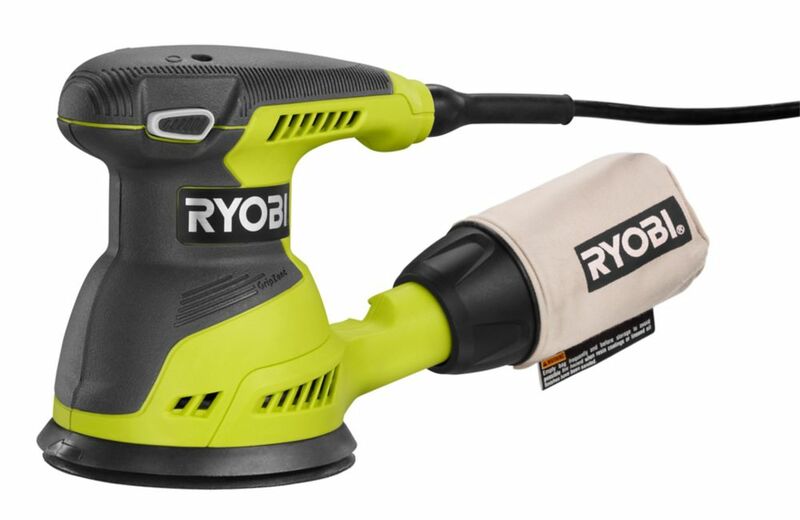 2.6 Amp 5-inch Random Orbital Sander The Ryobi 5-inch Random Orbit Sander features a powerful 2.6 amp motor and 12,500 orbits per minute to deliver a smooth performance in a variety of sanding applications. The sander's ergonomic design offers improved comfort as you work, plus the tool accepts hook and loop sandpaper for fast and easy grit changes. 2.6 Amp 5-inch Random Orbital Sander is rated 4.1 out of 5 by 524. Rated 5 out of 5 by Mickey from Bought it for a friend..haven't had it for a long time and have not used a lot.all I can say it's... Bought it for a friend..haven't had it for a long time and have not used a lot.all I can say it's small and easy to handle. Rated 5 out of 5 by Stacey from We purchased this to sand our kitchen cabinets in between... We purchased this to sand our kitchen cabinets in between the coats of paint. This was a lot easier than sanding by hand. This came with clear instructions on how to properly use it and how to attach all the parts. RYOBI has quality built tools. They work as advertised. Great for DIYers! Rated 4 out of 5 by 2happyinnh from I got this for my 16 year old daughter to be able to finish a project sooner than if she sanded b... I got this for my 16 year old daughter to be able to finish a project sooner than if she sanded by hand. It did an excellent job, but it would have been even better if we'd had more experience so we'd know that the degree of pressure would make a difference. Our fault - not the sander's! It worked well, and fast. The only drawback was the bag - it didn't catch all the dust so we had a lot of cleaning to do afterward. Sanding jobs should probably take place outside. It was too dark and cold for that however. I look forward to doing more sanding with this - soooo much easier than sandpaper. Rated 5 out of 5 by Gabe from Solid tool runs smooth and does the job well.... Solid tool runs smooth and does the job well. Rated 4 out of 5 by Battman from Good product so far.....I haven't opened the box yet. I will be using this product within the nex... Good product so far.....I haven't opened the box yet. I will be using this product within the next two weeks. I'm sure it will be fine. All other Ryobi products purchased at Home Depot have been very good or shall I say excellent. Stay tuned.